This thrice-yearly publication covers issues affecting schools and communities nationwide. All current and past issues of R&D Alert are available online. 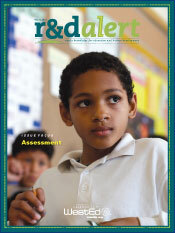 This issue of R&D Alert explores how researchers and practitioners are creating assessments to meet the needs of education in the 21st century. This volume of our Math Pathways & Pitfalls K–8 intervention curriculum helps students tackle stubborn pitfalls head-on and transform them into pathways for learning key standards for grades 4–6. Discussion Builders Workshop: Promote K–8 Student Communication, Reasoning Skills, and Language DevelopmentLead effective discussions that boost collaborative and respectful critical thinking and use of academic language among your students.